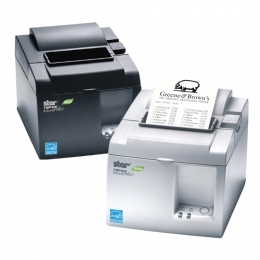 Star Micronics Receipt Printers - With its future-oriented futurePRNT technology, the low-cost, high-quality POS printer Star TSP100 ECO is the perfect choice for retail and hospitality. It boasts an intelligent power management system that reduces energy consumption by up to 40 , which results in a consumption of merely 30 W while printing and 5 W on standby, thereby fulfilling Energy Star requirements. The futurePRNT software tools further support this goal tickets are only printed on demand, the top border is reduced to 3 mm, 80 mm bills can be downsized to 58 mm and optionally scaled to 50 . In addition to the standard model, you have a choice of powered USB TSP100PUSB or Ethernet interface TSP100 LAN. There is also the high-end model TSP100GT with a printing speed up to 250 mm/s and particularly elegant polished housing in Piano Black or Ice White. When using specific paper, bills can be printed professionally in two colours black/red and black/blue at a quality of 8 dots/mm 203 dpi. Paper rolls of 80 or 58 mm width paper guide included are easily inserted thanks to the printers proven drop-in system. The integrated auto cutter then neatly separates bills from the roll with a partial cut. The TSP100PUSBE even prints out complex bills with logos, graphics and TrueType text within seconds. It can run on the powered USB interface or its standard integrated power adapter. The TSP100LAN is a cost-effective model, yet it offers fast data transfer and great flexibility thanks to its 10/100 Base-T interface. Apart from its high print speed, the GT models convincing feature is its stylish high-gloss coating. Whichever model is your favourite, they all come with impressive functionality and an accessory package that leaves nothing to be desired. This includes not only a complete futurePRNT software package, but also power and data cables not with TSP100PUSB, a paper roll adapter, mounting kit for vertical and wall installation and much more. The printers high compatibility with diverse operating systems, such as Windows, Linux, Java POS, OPOS, Apple MAC and more, ensure its implementation in almost any application. Star’s TSP143IIU ECO has been reduced in price to replace the TSP143U which has now been discontinued. Offering unique paper and power saving features with Star’s futurePRNT software (which works above the customer’s core POS setup) allowing the user to set the auto paper length and width reductions plus reduce the top margin to as little as 3mm which has proven to reduce paper costs by 70%. For large chains, configure just one printer to then roll out to the whole estate. Fast & highly recognised within the POS industry, Star’s TSP143III USB has been selected by UK retailers including Harrods and Selfridges for their Traditional POS solutions. Alternatively, the TSP143III USB is the first POS printer to print and charge directly to an iPad or iPhone via the lightning cable supplied with the Apple device. A fast traditional LAN / Ethernet printer ideal for a stable connection across larger venues / outlets with unique Print-on-Disconnect customer warning feature. Also includes Star’s unique futurePRNT software. Out-of-the-box wireless desktop printing solution compatible with major operating systems including Apple iOS, Android, Windows and Linux handheld devices allowing the user to seamlessly migrate to another operating system, if required. Apple MFi Certified and AutoConnect feature will reconnect to the last iOS host after power on or out of range situation. Can be used with Star WebPRNT Browser to print direct from a web page and Demo apps are available on Google Play and iTunes stores.